This one's an oddball post. I promise that I'm trying to stick within the confines of seasonal availability. I really am. I know that, as well as you do, an Octoberfest brew is not typically available in mid-April. With some looking you may be able to find this beer on a store's shelf right now. According to the brewery's Beer Schedule, you shouldn't be able to, but I won't knock your ingenuity. One thing's for sure--I won't be able to find this on my local beer store's shelves. I've never found any New Glarus on a shelf. I just don't think they distribute near me. 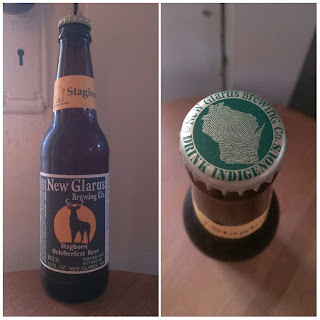 I got this last month at a delayed Christmas party that took place on St. Patrick's Day with two other New Glarus brews (look for them on here soon). I'm sure longtime readers are well aware of my infatuation with autumn. It is, without peer, the greatest season of all. When I saw that my gift included an Octoberfest, I knew it'd be the first one I'd tear into on here. So, what do I think? First things first. In order to fully appreciate a beer, I am a firm believer in the idea that you need to know something about where it came from. New Glarus Brewing Company, which is based out of (you guessed it) New Glarus, Wisconsin, is based upon the work to two people: Dan and Deborah Carey--co-owners of the company. Dan is the brewmaster, who has a ton of brewing experience under his belt (the guy apprenticed at an actual German brewery!). After working for Anheuser-Busch as a production supervisor, he and Deborah started up New Glarus in 1992 and (presumably) never looked back. Speaking of Deborah, she is the company's president. 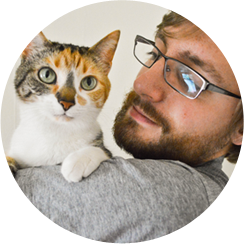 She raised the money to start the company herself as a gift for Dan. I wish someone would gift something similar to me. As for New Glarus' beer, it's won numerous awards and is brewed with natural ingredients. If you want to know more, check out the brewery's Brew Crew page. All told, New Glarus seems to be a company that knows its beer. As far as Staghorn is concerned, the official page for it mostly echoes the sentiments on the bottle: it's smooth and brewed with natural ingredients in a time-honored, traditional manner. What's online that isn't on the bottle is that it's classified as a Bavarian Octoberfest and has a spicy aroma. Neither the webpage nor the bottle list the ABV. However, Untappd (which has two listings for Staghorn) tells me it's somewhere in the neighborhood of 6.25-6.5%. First and foremost, let me address the aroma. I do pick up a few spices from it (damned if I know what they are, though). I also get an unmistakable autumn aroma. It has the warm quality that you'd find in a top-notch pumpkin ale. It's excellent and inviting. Even Purrl kind of liked it, seeing as how she gave it six whiffs. When it comes to the flavor, Staghorn is punchier than a typical Octoberfest beer. It has a hoppy kick in place of sweetness. This isn't something that's bad, it's just unexpected. The beer also has that almost watery lager quality. It breaks the mental boundaries I'd set for myself about what an Octoberfest brew is. If it wasn't for the aroma, I don't think I'd place this as a fall seasonal. New Glarus nailed the description of the brew in the mouthfeel department. Smooth. I think I'm drinking this beer at the right time of year. Yes, I know it's meant to be consumed in the fall, but that's not what I'm saying. See, when I was finishing up my undergrad, Michelle (my fiancée--I'll be referring to her by name from this post onward) and I went to a park on a nice spring day and lounged under a tree. She dozed and I read The Lord of the Rings. The spot we chose was secluded. It was just us, the birds in the surrounding trees, and the insects buzzing around. The air was filled with the scent of blooming flowers on that bright, late-spring day. I have no idea why, but this distinctly fall brew makes me think of that pleasant spring day. And, wouldn't you know it, today was a pleasant spring day. Like I said, this is the right time of year for me to be drinking this beer. 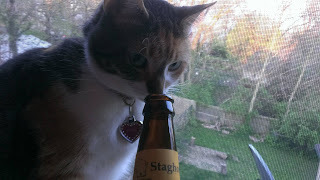 New Glarus Brewing Company's Staghorn Octoberfest Beer is good. While it is not my favorite Octoberfest, it still ranks pretty highly. I give it an 8.0/10. Should you happen to find it, buy a sixer and take a swig from a bottle. Who knows, maybe you'll like it more than I do.